Formulated for the active outdoor goers, our unrefined and natural Sports Shea Butter will penetrate quickly offering deep moisturizing benefits in extreme environments. A little goes a long way. Available in 1.7 or 4 oz jars. 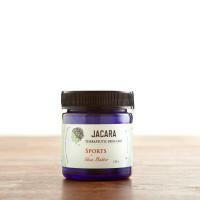 Visit our Retail Locations page to see where you can purchase Jacara Skin Care products.